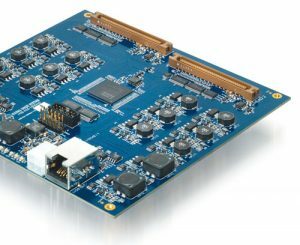 England-based Global Inkjet Systems (GIS) has expanded its product range with the addition of flexible drive electronics compatible with the Konica Minolta (KM) KM1800i and KM1024i double-head modules. Konica Minolta now offers these pre-aligned modules — used in its Konica Minolta Nassenger SP-1 single-pass digital textile printer and the KM-1/KM-C cut sheet printers — to original equipment manufacturers (OEM) machine builders and system integrators. According to the company, the GIS HIB-KM1024i and HIB-KM1800i Head Interface Boards — both capable of driving two printheads — work with the new KM printheads and offer complete printhead waveform control.